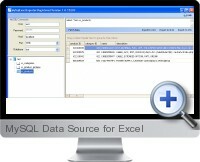 MySQL Data Source for Excel exports Excel compatible spreadsheets (XLS, XLSX and CSV) from MySQL data sources. MySQL Data Source for Excel reads MySQL database tables by creating a data source connection to a MySQL server, executing an SQL statement and exporting data to the desired Excel format. Furthermore, data can be optionally filtered, grouped and edited interactively before the MySQL data is converted and export to Excel. MySQL data can be full data tables, aggregated data, grouped or sorted data, filtered data, column re-aligned data, and more customization options. Easy to use by specifying the data source server host name, user name, password, database, and SQL statement before fetching the data and exporting to Excel formats. Allows double click on a table to generate simple SQL select code. Allows sorting and reordering of the MySQL data results. Allows grouping of the exported data results by columns. Ability to filter the MySQL data interactively on export. Ability to search the data source results for specific data rows.